'Baar baar dekho' this wonderful dance video. Bride Dalia Benedict's dance video is viral and wonderful. 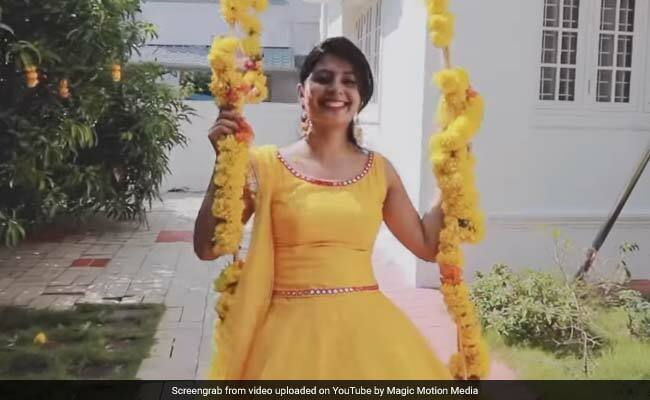 New Delhi: The big fat Indian wedding spectacle got even more fun with this bride's wonderful dance video. Bride Dalia Benedict's dance video for her haldi ceremony was shot entirely in one go, without any cuts, to one of the hottest wedding tracks from last year: Nachde Ne Saare from Baar Baar Dekho. But that's not all, for she got her whole family to dance with her for the video. This means parents, siblings, aunts, uncles and cousins, all matching steps with the happy bride in matching yellow and white outfits. Shot and uploaded by Magic Motion Media, the one-shot video has been viewed over 3 lakh times on YouTube and 9 lakh times on Facebook, with many congratulating not just the bride-to-be but the whole production team and the family for their performance. "This is incredible! Having active participation from the family and making them do this, hats off to you people! Brilliant work on the camera!" writes a commenter on Facebook. Another agrees, "One of the best performance (sic) I've seen....Beautiful!"